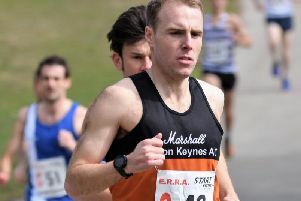 A battle between MMKAC’s Steve Tuttle and Leighton Buzzard’s Elliot Hindwas the highlight of the 34th Tour of Milton Keynes. The Tour sees athletes compete across five days around various routes in Milton Keynes. Hind and Tuttle traded times throughout the Tour, but going into the final round, Tuttle needed to beat his rival by 15 seconds in order to take the title. Despite beating Hind around Willen Lake and Woughton, the Leighton man held on to take the victory by 14 seconds. Tuttle was second overall, with Tring AC’s Ross Langley completing the top three. In the women’s race, guest racer Ella Townsend led the way ahead of MMKAC’s Helena De Villiers and Marthina Royles.